Ideal for your home office or small business, the Brother MFCJ5330 Business Smart Plus Colour Inkjet Multifunction is a true productivity booster. 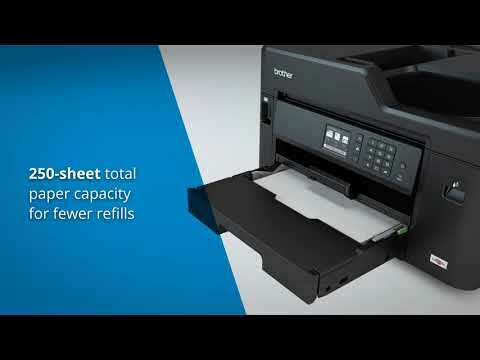 With business-focused features like flexible paper handling capabilities, ability to print up to 11"x17", automatic two-sided printing, wireless and mobile device connectivity and Super High-yield ink cartridges, this machine will change the way you get things done. As an added bonus, you get a two-year limited warranty with free support for the life of your product. What more could you ask for? Paper Handling Size - Paper Tray Letter,Legal,Ledger,Executive,C5 Envelope,Com-10,DL Envelope,Monarch,A3,A4,Index Card 5 x 8,A5,A6,Photo 3.5"x5",Photo 4"x6",Photo 5"x7"
Paper Handling Size - Manual Feed Letter,Legal,Executive,Ledger 11" x 17",A3,A4,A5,A6,C5 Envelope,Com-10,DL Envelope,Monarch,Indexcard 5" x 8",Photo 5" x 7" ,Photo 4" x 6",Photo 3.5" x 5"